In episode 075, part 2 of our interview with animator Alex Salsberg, Alex shares how he and several of his animation compatriots started Animatic Boston, the dos and don’ts of networking, taking care of your mental health, and what he would tell his younger self. And he shares one of his latest projects, his very own podcast Not Uncut! 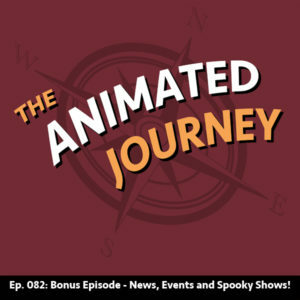 We also share what’s going on in the world of animation! Jeff will be there! Booth #1232 in the web comic section. As a kid Alex Salsberg created comics and dreamed of working in the animation industry. After attending Rochester Institute of Technology, teaching animation and freelancing for several years Alex created his own animation business, PokeGravy Studios, where he creates animated content for clients including MTV, Nickelodeon, Skype, KOA, Akamai and more. Hear the ins and outs of learning the craft, creating a business, contracts, finding clients, firing clients and keeping a healthy work/life balance in part one of our interview! Ep. 073: Lila Martinez – Storyboard Artist for The Simpsons, American Dad!, and More! Episode 073 features American Dad! storyboard artist Lila Martinez! Lila grew up in Mexico City, studied graphic design, attended Vancouver Film School to study animation, and created her own animation boutique studio BEFORE moving to the states to pursue storyboarding and working for some of the longest running animated shows in history. Find out how she did it and her advice for up-and-coming artists in today’s episode! 7:30 p.m. – 11:00 p.m.